Last week I got a phone call in response to the article about Eugene Landry. (see previous post). The caller said he was sitting in his car at Swanson’s. He’d been reading the newspaper while his wife shopped for groceries, and found my story. “I’m the guy who built Gene’s dome.” His voice was soft and had a hint of a smile. This was the second phone call I’d received since the story was published six weeks ago. Since then I’d been working on a timeline of Gene’s life, and had a lot of blank spaces to fill. 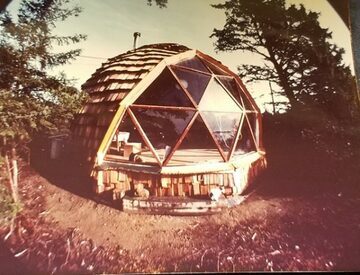 The story I wrote mentioned the geodesic dome and small beach front cabin where Gene once lived and made his art. Although many remembered it, so far I’d not been able to turn up any photographs of the dome, which had been razed in 1998 to make room for casino parking. Today a gas station sits on the site. I talked to people to get a history of the dome, but after forty years, the facts were hazy. I heard the dome was put up during the summer of 1978, possibly by a hippie who drove a Rolls Royce…or was it a Citroen? or was it someone else entirely? Maybe it was the guy with the great danes… Someone said a couple of guys from Canada might have put it together from a kit and then moved on. And so it went. I never expected to talk to the actual builder of the dome, figuring he was either a fugitive, dead or just plain untraceable. And suddenly this sweet guy from the nearby town of Cosmopolis was on the phone, with a story to tell. 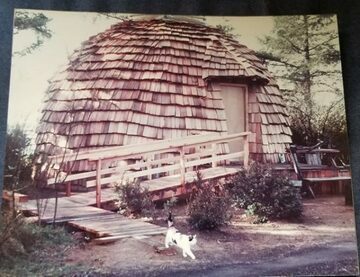 Over the years Gene had two domes built on the Rez. Each had a wooden ramp to accommodate his wheelchair and were used as studio space. One was on the hill behind the smoke shop,the other was on the edge of the bay. Obviously the dome design was important to him. Was it the philosophy? The lifestyle? I had to learn more. One week later, I drove through a quiet neighborhood in Cosmopolis, an old logging town, looking for the home of Don Norkowski. Following his directions I turned off off Highway 101 and looked for “the house surrounded by rhododendron bushes”. A sandy haired man wearing a grey blazer over a colorful shirt and blue jeans greeted me at the door. He reminded me of a high school band teacher, he had that air of patience and good natured smile. Don invited me inside and introduced me to his wife. In the living room a box of photos and old newspaper clippings sat on the couch, along with two original pieces of Gene’s art. Like something out of a dream, he handed me a photo of Gene’s dome. At last-proof that it really existed! While a student at Evergreen State College in Olympia, Washington, Don took a class called Space, Time and Form. 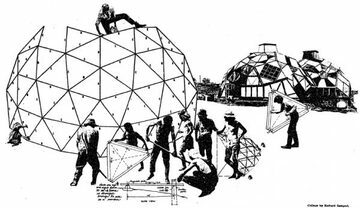 He learned how to build geodesic domes from a book by Lloyd Kahn called Domebook. Gene hired Don to build his dome. Back then, in 1976, the daily wage was five dollars an hour. Don recycled old growth 2x4s, planing and oiling the surface, to build the frame. They used beach-salvaged Alaskan cedar to make the girders. “It smelled like perfume when you cut into it.” he said, with a nostalgic tone of voice. Over the course of a summer a dome was built and a friendship made between Don and Gene. 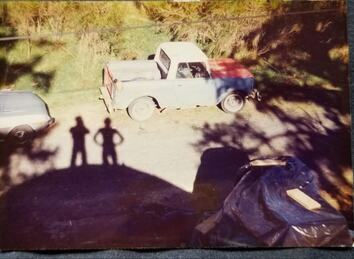 He visited after the job was completed, showing me a photo of how Gene kept it as an art studio. It was sparsely furnished inside, with a wood stove and simple lighting. I ask Don why he thought Gene liked domes. 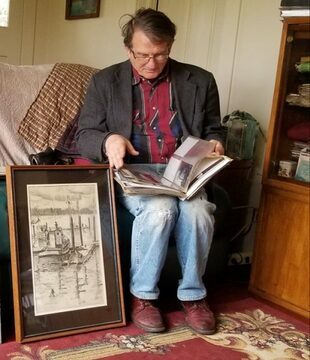 Don’s brother gave the drawing back to him after his sister in law passed away in 2001. As the time came for me to leave, I asked Don how he would sum up his time with Gene. He paused for a moment to gather his thoughts and find the right words. 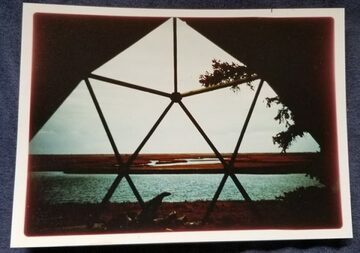 This entry was posted in biography, Eugene Landry, Inspiration and tagged Buckminster Fuller, drop city, Eugene Landry, geodesic dome, Shoalwater Bay Tribe, Tokeland WA on April 19, 2019 by admin. Exciting news! 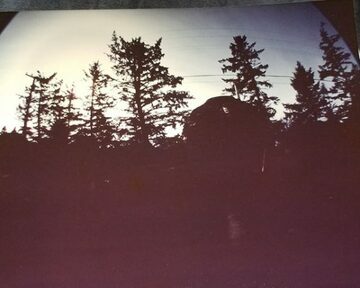 Since last winter I’ve been researching the life and art of (now) obscure NW artist I met many years ago, when I first came to Tokeland. His name was Eugene Landry. I’m sharing an article I wrote for a local newspaper about my search for Gene’s art. This is just the beginning. I’ll be sharing progress (and roadblocks) here, on my blog. My goal is one post every week. This entry was posted in biography, Eugene Landry, Uncategorized, writing on April 10, 2019 by admin.